The 1 Gang Asbury Dark Oak Wood, Polished Brass Fluted Dome Period switch has been handmade and finished by our skilled craftsman in our workshop in the United Kingdom. The exceptional quality of this Asbury Period switch is obtained by using modern manufacturing techniques and hand finishing to give this classic Period switch timeless beauty. 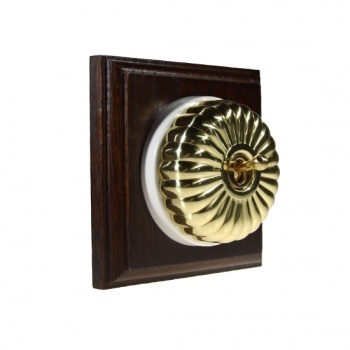 This 1 gang Asbury Period switch is backed with a hardwood dark oak wooden pattress and fitted with Fluted Polished Brass dome Period switches.